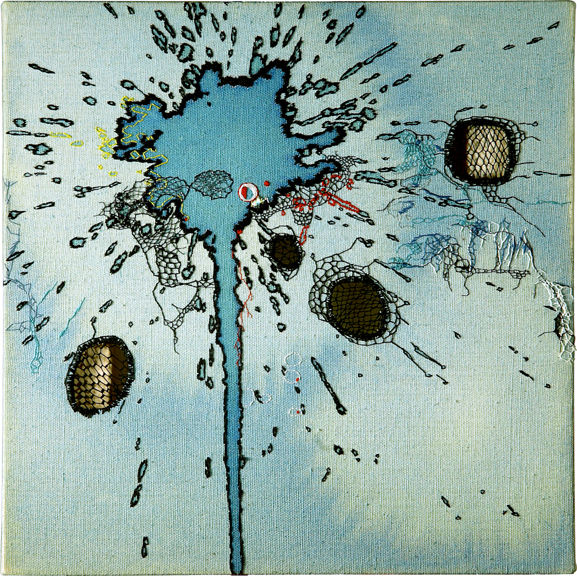 Nava Lubelski, Spring at the Pole, 2006, thread and ink stains on canvas, 12" x 12"
Nava Lubelski’s work investigates the tension between damage and repair. Deliberate destruction of the canvas is followed by needlework to 'repair' the damage. Mending, traditionally a domestic duty with a practical outcome, now functions as a means of artistic expression. This work has an explosive quality which I am drawn to. It ties in with some of my work which uses splotches of ink on absorbent paper to create dynamism. Additionally, the use of needlework is also relevant to my work.